Hi everyone. I'm new to Audiobus as well as this forum. I'm also new to ios music making. I've installed Audiobus as well as Soundprism, Sunrizer, Magellan, Loopy and a couple of beatboxes on an iPhone 4S. I'm still learning the basics. I'm trying to figure out how to use a rhythm from one app to control tones in another. For instance, I'd like to create a rhythmic tone in maybe, Soundprism, for instance, instead of a continuous one. But since I'm new to this I'm afraid I don't have the jargon to properly ask the question. Thanks in advance. I think you may be referring to one app 'playing' the sounds in another app via MIDI. Perhaps, if you describe exactly what you're trying to achieve (e.g. I want to play the "Piccard" arp patch in Magellan and have it actually sound using the "Rhodes" patch in SoundPrism) it will be easier to help. Or check out the soundprism website for more vids. Have you had a look at http://soundprismhowto.com/ yet? "(e.g. I want to play the "Piccard" arp patch in Magellan and have it actually sound using the "Rhodes" patch in SoundPrism)"
That's actually a good start, Washboy. I know how to play the Magellan Jr "Piccard" arp patch sounds in SoundPrism. I want, in SoundPrism Pro, to play/hear the "Rhodes" patch sound using the "Piccard" arp patch without the "Piccard" sounds. I assume it must be in one or both app's midi settings but I've not found a setting that works. Thanks for your help. Yes, thanks. I have been through the videos. I've been unable to find what I'm looking for. Is it maybe not possible to do what I'm asking? Should I consider a different approach? Configure the 'controlling' app (i.e. the one you'll have in the foreground and with which you trigger the notes played, e.g. Magellan) to send MIDI out to the 'slave' app (i.e. the one you want to make the sounds, e.g. SoundPrism). Configure the 'slave' app to accept MIDI in from the 'controller' app. Usually, you'll need both apps to be running at the time you configure MIDI, so that they can 'see' eachother. If the 'controller' app makes its own sound, either switch internal sounds off or turn down its volume control. 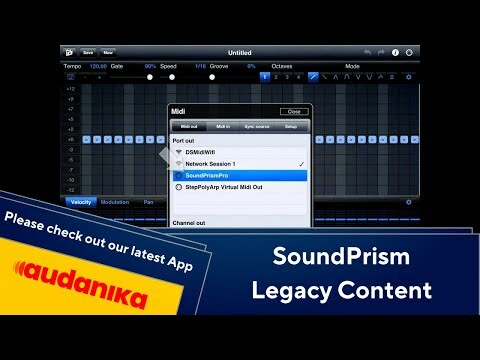 SoundPrism: Select the patch you want to hear (e.g. Rhodes). Configure 'Preferences / MIDI / Background Audio'=ON. In 'Preferences / MIDI / Sources and Destinations /', "Magellan" needs to be ON in the list of MIDI 'receives' (you don't need anything ON in MIDI 'sends'). You can leave 'React to internal MIDI' ON - it makes it easier to audition SoundPrism's sounds. 'MIDI In Channel' should be set to OMNI (until you know how to be more precise). Magellan: I'm no expert here so I can't advise the best ways of making arps, etc., but to make Magellan control SoundPrism, press the 'Prefs' button to reveal the MIDI settings. Make sure the 'Out Ch' is set to "OMNI" and that the 'Midi Out' button is glowing green (if not, press it). Press the 'Outputs' button and make sure SoundPrism is ticked/selected. Control the level of the Magellan's own sound using the main 'VOL' knob (top left of screen) - turn it to zero to hear only SoundPrism. Hope this helps. Do check @sebastian's link above. This is totally possible, but just a bit complicated. EDIT - washboy beat me to it. That should work as he described. I don't have soundprism but I've successfully sent Magellan Arps to Animoog with this method. Thanks for all the excellent advice. But I'm still stuck. I've checked the videos. I've followed Washboy's very detailed instructions. But still, I can't arpeggiate SoundPrism Native sounds alone within SoundPrism using arp patches from other apps. I can play SP sounds alone, no arp. I can play SP sounds along with arp patch sounds. Or, I can play arp patch sounds alone. I'm thinking I need to look for a different solution. I probably need to understand more about creating and editing patches and arps within synths. I just thought that arpeggiating the SP sounds would be straightforward. I think you're looking for this maybe? @genebauer: "...I can play SP sounds along with arp patch sounds.". Did you turn down the main volume in Magellan? Then it would be SP-only sounds with the Magellan patch's arp. There's also a whole arp editing section in Magellan that looks very flexible. Perhaps you should study that section. I tried turning down the Magellan main volume. It doesn't help. It doesn't turn all the way off, just way down. Then the sounds in SP are truly awful. I tried using the settings from the SP Videos: Controlling Synths > Advanced Setup. I got mixed results. Sunrizer for iPhone doesn't appear to have a way to set specific tempos. The result is that the Sunrizer arp is out of tempo with MoDrum. Or, at least, that's the result I get. The Sunrizer Help File was not helpful. It's more for the iPad. I get the impression that many apps are more fully developed for the iPad. It appears that what works on the iPad may not so fully functional on the iPhone. I thought that what is possible on the iPad with these apps is also generally possible with the iPhone. I appreciate how helpful and responsive everyone has been. I don't want to leave the wrong impression. Most of these apps are great. On their own they do some truly awesome things. It's obvious that the developers and users work hard to make them great. It must be a challenging task to make them all play nice together. "I tried turning down the Magellan main volume. It doesn't help. It doesn't turn all the way off, just way down"
As for SP's sounds being truly awful; do you mean they're distorted, not to your taste or something else? If they're distorted, you could turn down the master volume in SP ('Home -> Preferences -> General') or, more likely, reduce the MIDI note velocity in SP ('Home -> Preferences -> Expression'). I'm sorry but I can't help with Sunrizer or MoDrum.